Diu is an Indian union territory that is located on the western coast of India. It was a Portuguese colony for many centuries and is laced with relics and landmarks from that era. Diu has an inexplicable beauty of its own that meticulously combines the Portuguese culture and the Indian way of life. We have compiled a list of places that you must visit when in Diu. Ghogla Beach is one the cleanest beach in Diu. It lies north of the city 20 minutes away from the hustle and bustle of the city. The beach is comparatively secluded from the prying eyes of tourists. Since not a lot of people know about this beach, the entire atmosphere is relatively calm. The beach is clean as well as safe for those who want to enjoy some quiet time with their friends and loved ones. The beach although being secluded has some water-based activities like parasailing, surfing, and Banana Boating. 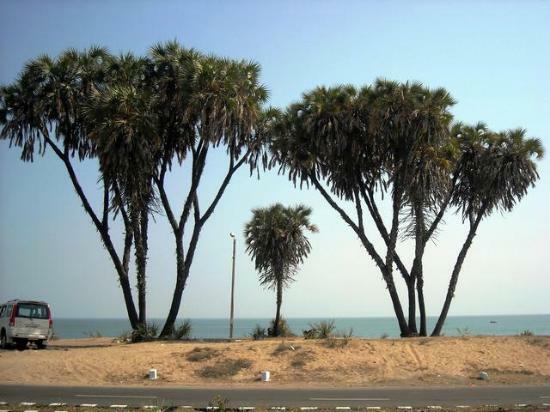 Nagoa Beach is well known for swaying palm trees and the pristine beauty that surrounds the beach. The place is an ideal spot if you want to soak in some sun. The beach is also lined with resorts that offer cheap accommodation that enable the visitors to spend more time by the beach. The beach is also blessed with white sand that adds to the aesthetic beauty of the beach. Activities at the beach include camel riding, horse riding and other forms of water sports. Jallandhar beach apart from being a beautiful beach also has an interesting backstory to it. The beach is named after the ‘Asur Samrat’( demon king) Jalandhar who was said to have slain most of his enemies on this very beach. There is also a carving of his head on the nearby mountains to acknowledge and please the might of the demon king. The Gomtimata beach is located west to the town of Diu and is considered to be one of the best beaches. The beach boasts of a clear coastline and sand so clear that it gives off a white hue to the beach. The beach is also untouched by the general public which means you can enjoy your moment of serenity with nature without the fear of being disturbed. Thea beach also has a temple nearby if you wish to get in touch with your spiritual side. St. Paul’s Church is a popular landmark in Diu and garners the attention of both locals as well as tourists. The church is dedicated to Our Lady of Immaculate Conception. The construction of the church took nearly ten years and is in the Gothic architectural style. The church is interior with wood panelling that is considered to be the best in all of Diu. The Portuguese influence on the church is clearly evident in the wall paintings in the church. The Gangeshwar Mahadev temple is a favourite amongst Lord Shiva worshippers. The temple is located a 20-minute drive from Diu in the serene Fudam village. Legends associate the temple with the Pandavas, who established the Shiva lingas at this very spot, making the ground sacred. The unique feature of this temple is that the lingas are in the middle of the sea. Diu Fort is a remnant of Portuguese rule. The fort also used to double up as a castle and was used by the Portuguese as a strategic military point. The fort also houses a lighthouse in its compound. And has relics like cannons. The fort was once listed as one of the wonders of the world but this was when it was under the colonial rule. Since the ousting of the Portuguese, the fort now serves as a popular tourist spot and an important landmark in Diu. Panikota Fort, otherwise known as Fortim-Do-Mar by the locals, is a famous island fort located near Diu. The fort is located on a small island in the bay of Simbor that lies approximately 46 kilometres from the coast of Diu. After gaining independence from the Portuguese the fort was used as a jail. The island is surrounded by sea on all sides, making it almost impossible for any inmate to escape. The fort now remains unoccupied and home to a ruined chapel. Nadia caves are located very close to the Diu Fort. The caves are a prime example of Nature’s incredulous wonders. At the surface, they appear like any other caves however the Naida caves form series of interconnected tunnels that go on for miles. The caves are also lined with steps for easy access to the caves. A trip to the cave will leave you in awe of nature’s powers. It is said that thieves would use these caves to elude the authorities. Sunset point is located on the Chakratirtha beach in Diu by a hillock that acts as a viewing point. The hillock has been further converted into an enclosure that enables the people visiting the spot to view the sunset without getting wet from the nearby sea waves. Besides the enclosure, there is also a pedestrian walk that is lighted up during the evenings. This makes it possible for visitors to take strolls by the promenade and admire the beautiful sunset. The Zampa Gateway is an attraction in Diu and serves as an important landmark in the city. True to its name, it’s a walled gateway that connects the town with its surrounding outskirts. The gateway is laced with carvings of angels, lions, and a priest. The gateway also houses an artificial waterfall that only enhances the aesthetic of the gateway. INS Khukri Memorial is a site that pays homage to the fallen heroes of the Indo-Pakistan conflict of 1971. The true ship was sunk by the coast of Diu after being hit by three torpedoes from a Pakistani submarine. The brave sailors defended the coastline of India till their very last breath and to celebrate that spirit the Indian government decided to build the memorial. There is also an amphitheatre in its vicinity that reenacts the act of valor by the fallen soldiers. As the name suggests, the Shell Museum houses a massive collection of shells. The shells were all collected by a merchant navy captain Devjibhai Vira Fulbaria. It is sad that his collection is a result of over 50 years of sailing and collecting. Since his passing, the museum took over the collection and has used to educate its many visitors. Once in the museum, you can embark on a guided tour of the museum where the staff members educate you on the difference between cowrie shells and poisonous cone shells. The Diu Museum is another important landmark in Diu. It was originally constructed as a church dedicated to St. Thomas in 1598 but since then has been converted into a museum. The museum boasts a collection of stone inscriptions from past rulers, multi-coloured fountains and wood carvings the depict a beautiful picture of Diu’s rich cultural past. The church also houses 400-year-old statues of St Thomas and St Benedict that are carved out entirely of wood and Marble. One of the most unusual places to visit is the Hoka trees that are native to places Africa and the Arabian Peninsula. The Hoka trees in India can be only found in Diu. The Hoka tree lends a unique beauty to the coastline of Diu. The seeds of Hoka trees seeds were used in Ancient Egypt during their funeral rituals. An alcoholic beverage called ‘Tadi ‘is prepared using the Hoka tree seeds. Despite being a small union territory, these famous places to visit in Diu are surrounded with beauty. So the next time you decide to visit the picturesque town do give our mentions a try and let us know of your experience in the comments section below.